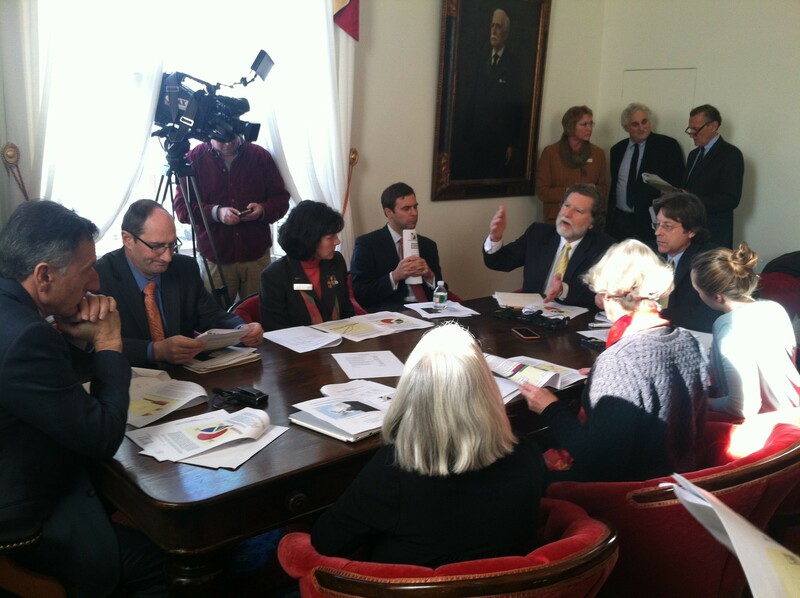 Economists Tom Kavet (gesturing) and Jeff Carr speak Tuesday to Gov. Peter Shumlin and legislative leaders in the Statehouse. The good news: Your household will have $2,500 more to spend this year, thanks to lower oil prices. The bad news: That’s bigger than any raise you’ve likely seen in years. As a result, your and other Vermonters’ incomes continue to suffer, and so do the state’s revenues. With that news in hand, Gov. Peter Shumlin and the legislative leaders who compose the state's Emergency Board signed off Tuesday on an $18 million reduction in anticipated revenues for the next fiscal year, which starts in July. The move comes days after Shumlin unveiled his fiscal year 2016 budget. Shumlin said that means that with other anticipated changes, he and legislators will have to cut $14 million to $16 million more from the budget. He suggested, however, that he’s expecting the news to improve by the time lawmakers sign off on the budget in May. Economists for Shumlin and the legislature agreed that despite promising signs in the economy related to lower oil prices, the state’s General Fund was likely to see $18 million, or 1.3 percent, less in revenue than previously thought next year. The economists also said the state’s General Fund should expect $10 million less in revenue in the current fiscal year. Shumlin said he’s already accounted for that $10 million drop in the budget adjustment legislators are now considering. Despite the downgrade in projected revenues, economists Jeff Carr and Tom Kavet gave an upbeat report on the economy. Lower oil prices will save Vermonters $600 million, or $2,500 per household, in 2015, Kavet said. The drop in oil prices hasn’t yet been reflected in the economy, he said, but could bring a reversal of fortunes for state revenues when the economists offer a new projection in July. Meanwhile, though, the picture is less rosy. Personal income taxes, estate taxes and corporate taxes are fluctuating wildly, Kavet said, yet the state has grown more dependent on those taxes than it has been in the past. In 2004, those taxes accounted for 50 percent of the General Fund, Kavet said. In 2014, they were 60 percent, he said. The taxes depend heavily on chance circumstances, he said, such as the number of wealthy people dying. Last year, the estate tax brought in $35 million, whereas in the first half of this year it has generated only $3 million, he said. “It’s a roll of the dice,” Kavet said.